March | 2011 | OK GO! I figured 10 pulls (various techniques) on the cable would roughly equal a 15′ climb. Maybe not given that the climb is more leg driven than anything, but it seemed like a good idea at the time. It didn’t seem like a good idea from about round six, grinding out 58, 59, 60 and trying not to think about the 70+80+90+100 reps to go. Front squats felt challenging to begin with and got better as I got hotter, but technique was solid all the way through. A quick lap around my favourite Williamstown loop. With a few refinements this could become a really good one hour lap. Just gotta remove a few t-lighted intersections. Conditioning: Dig out old stormwater pipe. Bury new stormwater pipe. 1.5–2 hrs of swinging a mattock in a confined space with bonus shovelling of clay. 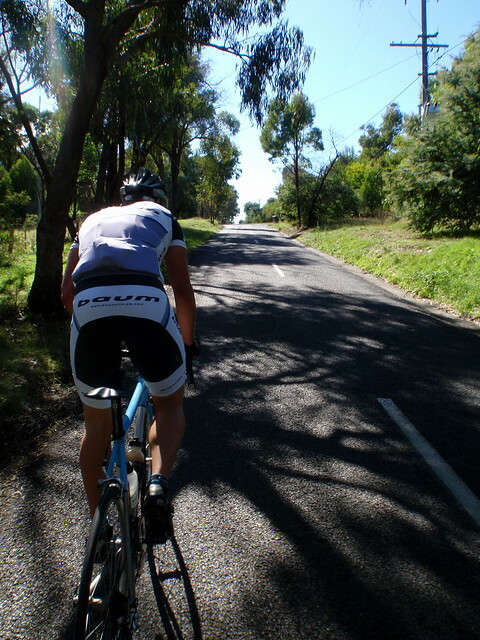 Today was your average awesome Melbournian Autumn day, and Nell took me out for a wee loop about the foothills of Eltham. 60k / 1,150ish m vertical and 2:30 in the saddle made for a solid outing for me, and a recovery day for him. Move bricks. Shovel dirt. Make path. Spent Saturday building us a new front path. Moved half a tonne of bricks on and off a ute. Shovelled two cubic metres of soil and one of sand, drove vibrating plat compactor. All done in just under 12 hours. Stopped for breakfast and lunch. No plan. Just back squats and bench. Air squats, push-ups, 3s and 5s at the work weight for the WOD. Bites will be one week in size. Meals will be a mashup of bike, scaled main-site and the random odd or end.